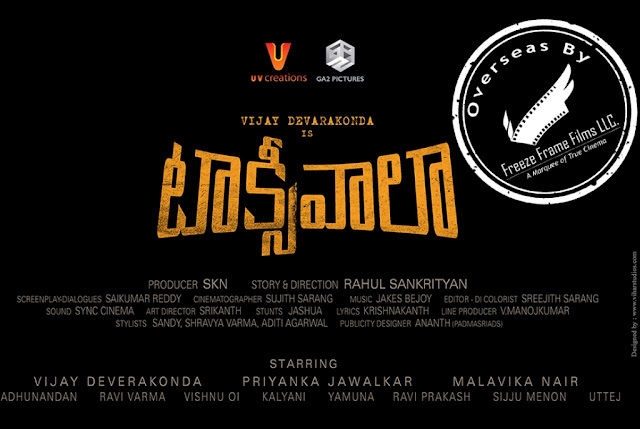 Vijay Deverakonda, the most desired hero of TFI, the name synonymous for ‘Million Dollar’ hero in the overseas market is back with his new flick titled, ‘Taxiwaala’ directed by Rahul Sankrityan and jointly produced by two prestigious and super successful production houses of Tollywood, GA2 and UV Creations. This dynamic actor who has given us surprisingly different genre Superhits is now again making a move against all expectations into the supernatural thriller comedy space- backed by two of the biggest production houses in TFI. The whole team is extremely excited to bring you this incredible film which will be Vijay's follow up to the CULT Arjun Reddy. Freeze Frame Films is super excited to bring this movie to the overseas patrons. We whole heartedly thank SKN garu, GA2 and UV Creations for giving us this opportunity. The movie has lots of CGI effects and the whole team is meticulously working on the final copy. The makers are planning for a grand release of the movie on May 18th with USA premieres on May 17th.